The cable market is a lucrative business in the gaming world that range from extremely cheap to extremely expensive. Fortunately for gamers across Australia, Futuretronics continues their trend of high quality affordable gaming cables and their latest addition to the market is their XBox 360 Compatible Component & S-Video Cable. Our first impressions of the XBox 360 Component & S-Video Cable was the quality of the product which featured a rather sturdy and thick cable. This ensures that the inside cables are protected from outside noise and interference which in turn effects the picture quality and can cause a variety of other problems such as ghosting and washed out colours. Another feature of the cable is that the plugs are gold plated which also improve the overall image quality that is generally found on mid-range to expensive cabling. 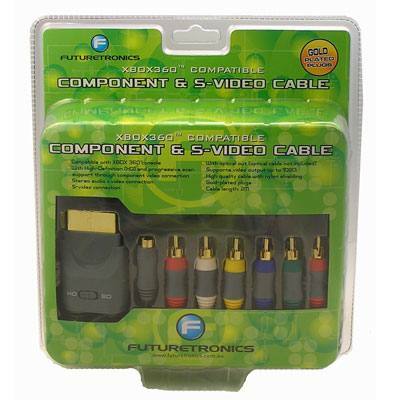 The Futuretronics XBox 360 Component & S-Video Cable also supports two different video formats with Component being near the high end of the spectrum (Digital televisions) and S-Video for standard televisions. The cable itself was easily connected to our XBox 360 console and our LG high definition TV and upon booting up our XBox 360, we automatically noticed a difference to the picture quality when compared to our standard component cable. The images were now crisper and sharper with colours appearing more vibrant and realistic. We also tested the S-video aspect on an older television, however the differences were minimal which may be an indication of the television, rather than the cabling itself. Either way, for $49.95, the cable is definitely an investment for all types of televisions. In conclusion, if you are looking for an affordable and well made component cable for your high definition TV then we would recommend the Futuretronics XBox 360 Component & S-Video Cable. Definitely a worthy accessory for your console, especially those who have purchased the standard edition of the XBox 360 and wish to experience HD TV!